Up till now, the best Christian book on gossip (and the only book length treatment that I can heartily endorse) is Stop the Runaway Conversation: Take Control Over Gossip and Criticism by Michael Sedler. Unlike the works analyzed above, this creative and aptly titled book is not primarily about what to do when one is gossiped about or even how to keep from speaking gossip. Instead, Stop the Runaway Conversation is focused on teaching Christians “what to do when others want us to engage in ungodly conversation with them.” Sedler concentrates on the idea of an “evil report. . . . When an individual maliciously injures, damages or discredits another’s reputation or character through the use of words or attitude.” He wants to teach Christians to not defile themselves through receiving evil reports. Sedler repeatedly and effectively emphasizes the contaminating effects of sinful gossip on the hearts of those who listen to it. Stop the Runaway Conversation has many strengths. Sedler knows his Bible, and it shows. He is at his best when he is telling a story from the scriptures and unpacking its principles and relevant applications. He also illustrates nearly all of the applications with true-to-life and personal stories. Each chapter ends with good discussion questions. Sedler teaches believers about the warning signs of impending gossip, pernicious strategies that gossipers use to seduce listeners and create “false alignments,” and how to recognize when fear has seized control of a conversation. Sedler offers not only warning but hope. “A bleak and depressing picture? Yes, it is. Unless Jesus Christ is active in our lives we have little hope of escaping the snare of deception. Fortunately we serve a God of second chances. . . . What an awesome and powerful God! He cares deeply for His people.” Sedler offers multiple strategies of what to do instead of receiving evil reports, and there is an entire chapter devoted to being cleansed from the defiling effects of gossip. The criticisms that I have of Stop the Runaway Conversation are relatively minor and mostly matters of emphasis. At times, Sedler offers definitions that I would want to qualify or nuance. I would also value more teaching on the connection between the heart and words of a gossip. Even though at one point, Sedler offers ten heart motives that might produce gossip, he seems to answer the basic question, “Why do we gossip?” with the answer “confusion.” He seems, at times, to lean towards a “need-based” psychology. I would also like to hear more about how the good news of Jesus Christ counteracts gossip. At times, the gospel seems to be assumed rather than proclaimed. On balance, however, Stop the Runaway Conversation is a very helpful book. Sedler lovingly challenges believers to be bold for Christ. You recognize that the conversation is heading towards an ungodly discussion. You follow the suggested approaches found in previous chapters, such as asking questions in an attempt to understand the motivation of the speakers: “Do you need to be telling me this information?” “Have you talked directly with the people involved in this scenario?” So what happens after you have questioned the person and made it clear that you are not interested in being a part of the evil report, but he or she persists in telling you? At this point, you must take a stand. Amen. No matter what has been said in its defense by its many diverse and creative proponents, by God’s grace and in his power, sinful gossip must be resisted. Michael Sedler, Stop the Runaway Conversation: Take Control Over Gossip and Criticism (Grand Rapids: Chosen Books, 2001). Michael Sedler, Stop the Runaway Conversation: Take Control Over Gossip and Criticism (Grand Rapids: Chosen Books, 2001), 22-32. Michael Sedler, Stop the Runaway Conversation: Take Control Over Gossip and Criticism (Grand Rapids: Chosen Books, 2001), 47. It must be noted, however, that Sedler’s definition of confusion is not morally neutral. “Listening to conflicting voices and refusing to submit to the one of higher authority.” (ibid., 47). Ibid., 77. In his follow-up book, Sedler helps readers to distinguish between times when silence is golden and when it is not. Michael D. Sedler, When to Speak Up and When to Shut Up (Grand Rapids: Revell, 2003). Since I originally wrote these words, this book has been re-released with a new title and cover: Stopping Words That Hurt: Positive Words in a World Gone Negative. The first two chapters are currently available online to download. To my knowledge, the content is the same as before. Note: With this post, we have rounded up our long blog series systematically working through my doctoral research into the literature about the problem of gossip. My own contribution to the literature, Resisting Gossip: Winning the War of the Wagging Tongue will be available on Tuesday from booksellers like these! I'm excited to celebrate the release of Resisting Gossip with our church family on Sunday. 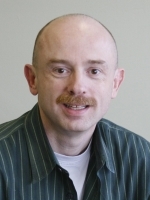 Dave Almack, the director of CLC Publications will be present with his wife Deb. We will have "choice morsels" to eat after church. I'll get to thank everyone who supported the project. And every family (including visitors!) will get a free copy of the book! 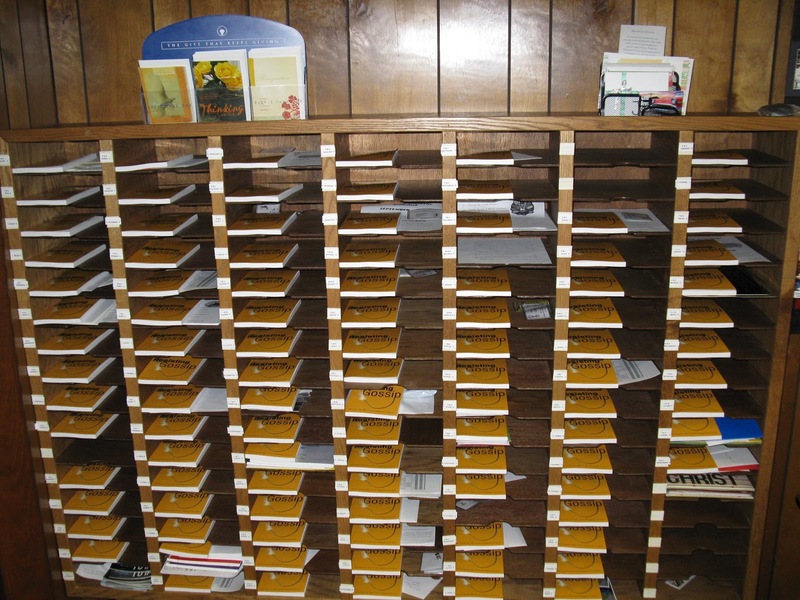 They are already in people's mailboxes. If you are nearby, we'd love to have you join us at church this Sunday at 10am. Gossip and the Gospel was written to warn believers of the wickedness and dangers of gossip and slander. “The church has forgotten that gossip is a vile sin before God.” Williams not only speaks from experience but is passionate about scripture and teaches from a broad range of biblical texts. I was greatly aided in my study by looking up, in their contexts, each text that he had quoted throughout the book. 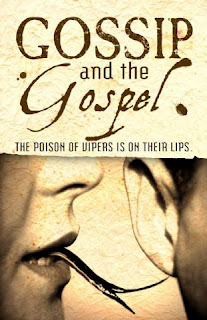 Williams offers several helpful insights about gossip, especially what it feels like to be gossiped about, how gossip is often an attack upon authority figures, how we need to trust God when slandered and not always defend ourselves, and how gossip cannot be simply refrained from but must also be replaced with edifying speech. 1 cup of pride – Proverbs 21:24, 3/4 cup hearsay - Ephesians 4:29, ½ cup evil suspicions – 1 Timothy 6:3-4 . . . 1. Mix together all ingredients in a bowl of betrayal. – Proverbs 16:28, Matthew 26:23, 2. Pour into a medium saucepan and bring to a boil; constantly stirring. – Proverbs 6:14 . . . 5. Sprinkle with the truth (optional). – Romans 1:25 6. Serve hot to itching ears, warm to those not minding their own business, and cold to those fearful. – Acts 14:2, 1 Thessalonians 4:11; 2 Timothy 4:3 . . . Makes Unlimited Servings. There is much to learn from here. And yet, Gossip and the Gospel is not a book that I can heartily recommend. It seems excessively alarmist, unbalanced, unclear, unhelpful, and possibly dangerous. In my view, Williams goes “over the top” in his zeal to warn against the sinful dangers of gossip. For example, the cover of the book features a photograph of a woman with a forked snake’s tongue slithering out of her mouth towards a man’s ear. Then a presentation page declares, “Presented Out of Love . . . This book is given to [blank] in hopes they will repent of the sin of gossip, slur, slander, or bitter roots.” I cannot imagine a situation where this approach would actually be helpful. Most unfortunately, and despite its title, the gospel is not clear in Gossip and the Gospel. While Williams repeatedly mentions the cross, there is no exposition of the atonement, no explanation of justification, no numbering of the blessings that come from the gospel. By and large, the cross seems to only be something that a follower of Christ picks up and carries or something that crucifies the flesh, not God’s gracious provision of propitiation, forgiveness, and eternal life. Williams may be (and very likely is) orthodox in his understanding of the gospel, but this never comes through in the book. Aside from the power of the Holy Spirit, there is not much hope offered in Gossip and the Gospel. Perhaps this is flavored by Williams’ own church experiences as they seem, unfortunately, to have all been bad. It is true that followers of Christ can and should expect to be slandered, but there can also be times when the church enjoys the favor of the people around it (Acts 2:47). Timothy Williams, Gossip and the Gospel (Enumclaw: WinePress Publishing, 2004), 16. 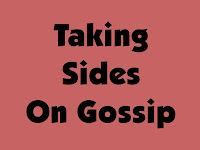 Gossip and the Gospel, like Overcoming Gossips and A Bible Handbook on Gossip and Slander, is self-published. The author, however, is now also the executive publisher of WinePress Publishing. Timothy Williams, Gossip and the Gospel (Enumclaw: WinePress Publishing, 2004), 17. Timothy Williams, Gossip and the Gospel (Enumclaw: WinePress Publishing, 2004), 106. This recipe has been adopted as the “No Gossip Policy” at WinePress Publishing. http://www.winepresspublishing.com/about/no_gossip (accessed July 19, 2011). See Ken Sande, The Peacemaker: A Biblical Guide to Resolving Personal Conflict, 3rd Edition (Grand Rapids: Baker Books, 2004), 127. Timothy Williams, Gossip and the Gospel (Enumclaw: WinePress Publishing, 2004), 117-118. Any of these points of advice might be good when balanced with other scriptural principles, but there are no balance points offered. And similarly to Robert Morey’s A Bible Handbook of Gossip and Slander, Williams’ book never calls for humble self-examination of any of the accusations to see what could be learned from them. Update: Since I originally wrote these words, Gossip and the Gospel has been re-released with a new, more friendly cover. It also now available as a free download. I don't know if any of the content has been revised. Note: We are rounding up a long blog series working through my doctoral research into the problem of gossip. 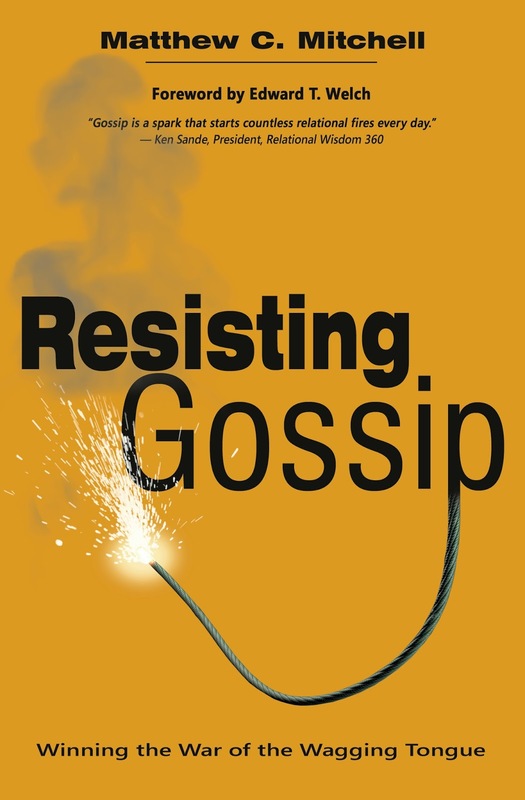 First Public Review of "Resisting Gossip"
Todd Hardin has posted an incredibly encouraging review of Resisting Gossip at the Biblical Counseling Coalition book review site. Matthew Mitchell has provided a practical guide that helps everyone recognize, resist, respond, and regret this pervasive and insidious sin. Because of its accessibility, strong biblical and theological foundation, and warm-hearted pastoral tone, biblical counselors will find this book an invaluable resource, not only for their parishioners, but for themselves as well. Resisting Gossip’s gospel-centered, elegant simplicity will benefit the church for years to come. 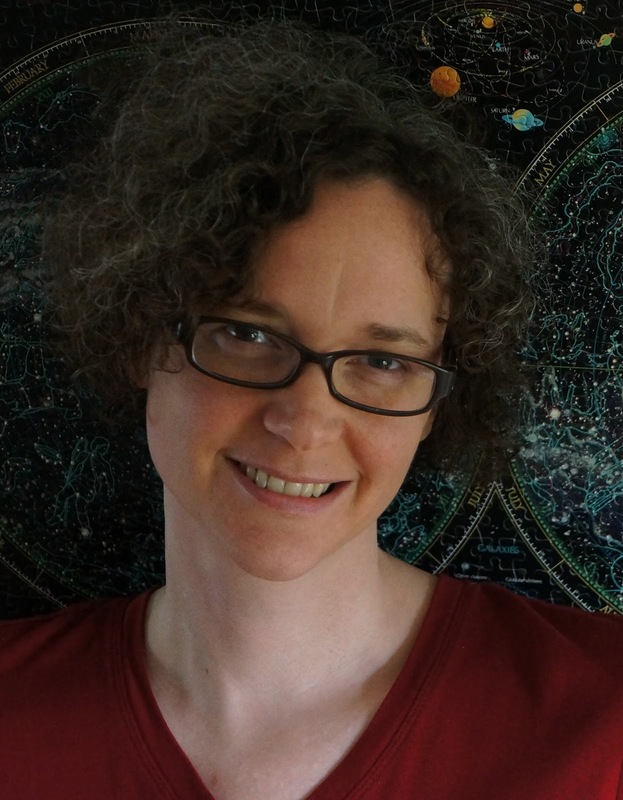 Elizabeth Nelson on "Resisting Gossip"
Elizabeth Nelson launched from a Masters of Biblical Studies to orbit the secular business world before exploring non-profit ministry, meeting her soul mate and crash landing into parenthood. This new world includes household management, dedicated homeschooling, developing photography skills, and far more sanctification than she anticipated. When she was growing up, she wanted to be an astronaut, and God fulfilled her dreams… His way. Countdown: Just 7 Days to the Release of "Resisting Gossip!" It's hard to believe that it's almost here. Resisting Gossip will be released in just one week from CLC Publications. It's been 5 years since I originally had the idea of a study of the problem of gossip as a doctoral project at Westminster Theological Seminary under the leadership of the faculty of CCEF. And now, the fruit of that project is going to be available to help Christians to recognize, resist, and respond to sinful gossip. If you want to know more, you can preview, download, and read the endorsements, table of contents, foreword by Ed Welch of CCEF, introduction, and first chapter at the CLC Facebook page or watch the video trailer below. 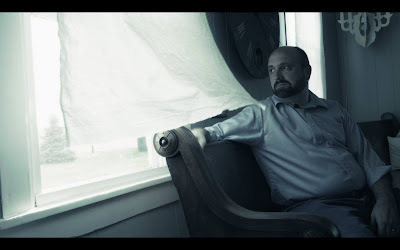 Internet apologist Robert Morey is no stranger to conflict. Anyone who steps into the public arena to strongly debate items vital to religion will find themselves in a battle, but an Internet search on Morey’s name reveals an exceptionally long list of accusations fired at him from many sides. Whether these accusations are slander or truth is not for me to judge, but they certainly demonstrate Morey’s credentials as someone who has had to deal with accusations. The chief strength of A Bible Handbook on Slander and Gossip is the copious use of scripture. 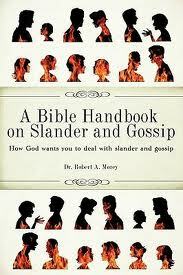 Morey has collected a fairly comprehensive list of texts from both testaments that relate to the topic of slander. He has then assembled commentary from reputable scholars to quote at length in connection with each text. The book is also peppered with stories that illustrate the principles being taught. Unfortunately, Morey’s self-published book is not very useful as a manual of what to do if you are attacked by slander and gossip. It is not easily accessible and does not offer a series of steps to pursue. It is mainly a compendium of data on the subject. Most of the book consists of verbatim quotations from commentaries with little explanation of what one is reading. The quotations are duly noted at the end of the book, but because they are very long and not attributed at the beginning of each quote, the reader can be easily confused about whose thoughts they are reading. A Bible Handbook on Slander and Gossip is arranged in a traditional outline form so that the indentions for the plenteous block quotes result in ridiculous margins for most of the pages. It very hard to read. There is no index, and the table of contents lists only the numbers of the chapters, not their names or subjects. Once accessed, the content of the book is pretty good, although Morey, aside from a list of twenty-one characteristics of a gossip monger, has himself offered few original thoughts. The tone throughout is mortally serious, and the book is filled with breathless warnings and condemnations of slander. Ignoring critics and practicing church discipline are the main remedies that a Christian leader can apply. It is perhaps telling that Morey nowhere suggests a few moments of humble self-examination to see if the critical accusations have any truth in them. Robert A. Morey, A Bible Handbook on Slander and Gossip. (LaVergne: Xulon Press, 2009). Much better is the approach taken in Alfred Poirier, “The Cross and Criticism,”Journal of Biblical Counseling 17, no. 3 (Spring 1999): 16-20. Mike Emlet was my second reader for my doctoral project on Resisting Gossip and was a terrific encouragement throughout the entire process. [Matt's Messages] "What You Hold In Your Hands"
Before we open our Bibles today, I want you to do something for me. I want everyone here to grab a Bible and hold it in your hand. There are Pew Bibles in the rack in front of you. Most of you hopefully brought your own Bibles. Kids, grab your Bibles or one in the rack in front of you. Some of you access your Bible on your phone, Kindle, or Ipod or Ipad. Get those out right now and put them in your hand. You are so blessed among people on Earth today and throughout human history. And not only do you have it in your hand, but all of you have it in translated into your own heart language, your mother-tongue. You are blessed to hold in your hand a copy of the holy Scriptures in a language that you can read! For 1,000 years the Bible was chained up. Literally. Only churches owned copies of the Bible and they were translated into a language that very few people could read, Latin. And the one copy a church owned would be chained to the wall of the church so no one would steal it. But now, you hold one in your hands. 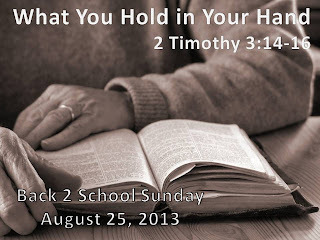 And that’s what we’re going to learn about today in 2 Timothy 3. Today is Back 2 School Sunday, when our students return to classrooms, hallways, lockers, desks, teachers, and textbooks. Books, books, books, books, books. But there is no other book in the world like what you hold in your hands today. I remember when I first got to Moody Bible Institute, one of our professors, Dr. Bill Marty took a pile of important books and stood in front of the student body and read the title of each one and then tossed across the stage. It was startling to see him treat those books like that. But then he held up his Bible and he said that this book was not like those books. This book was the word of God. That’s what you hold in your hands. And that’s what Paul was telling Timothy. Paul was leaving this life, he was headed to meet the Lord of the universe. This is his last letter in the Bible. And Paul, in his last letter, was encouraging Timothy to stay faithful in the gospel ministry. And this is his instruction for Timothy and it applies to us today. 2 Timothy 3:14. It’s one of those passages that everyone should have at least v.16 memorized because it says so much about what the Bible itself is and what it is for. The command is to continue in the teachings that Timothy has received and built his life upon. And these teachings are found in God’s Word, the Bible. Build your life on the Bible. Build your life on the teachings that you have received from the Bible. Don’t depart from the teachings of the Bible. Continue in what you have learned and become convinced of from what you hold in your hands today. There is a contrast going on here. Timothy is supposed to stake his life on the Bible in contrast to the false teachers that he stands in opposition to. There are all kinds of other things out there to stake your life upon. Jump up to verse 1 of chapter 3. Notice all of the alternative things that you can get caught up in. That’s what Paul is contrasting when he says in v.14. Don’t stake your life on those things. They won’t satisfy. They aren’t true. They aren’t lasting. They aren’t satisfying. Build Your Life on the Word of God. And then, secondly, it was Paul who taught Timothy the faith. Look up at verse 10. Timothy, you know me. You know that I am the real-deal and you know what I’ve taught you is true. Build your life on it! Put down roots in it and never leave. Timothy, you know your Bible. And you know what’s in it. You were taught it at your mother’s knee. Build your life on it. I remember the time at Moody Bible Institute when I decided to do this. I had been struggling with the reliability of the Scriptures and whether or not I was going to submit to their authority over my life. It came to a crisis point. I had always had a general knowledge and respect for the Bible, but I hadn’t really ever put myself completely under its authority and staked my life on it, come what may. But I reached a point where I decided that I would believe it and live it and if God would allow me, to teach it. And I have to regularly come back to that commitment. What You Now Hold in Your Hand Make the Blueprint of Your Life. Number One: Because what you hold in your hand. #1. GIVES THE TRUE PATH TO SALVATION. Now, interestingly, except for this and possibly a few other letters, there weren’t yet any New Testament Scriptures for Paul to be referring to. He was primarily referring to the Old Testament. That’s what Timothy would have been taught from his childhood and what he would have had to read. And Paul says that those Scriptures are able to point towards salvation through faith in Jesus Christ. The Old Testament points towards Jesus. And it does so faithfully, reliably, dependably. You need to read what you hold in your hands. This is where we find out the true path to salvation. This is where we are made wise to get saved–the Bible. There are a lot of false teachings out there about how to get saved. Even about whether or not we need saving. The Holy Scriptures teach us the true path to salvation. And the name of the path is Jesus Christ. And the way of that path is faith in Jesus Christ and His CrossWork. The Bible says that trusting in Jesus is the only way to salvation. Are you trusting in Jesus Christ as the only way to salvation? The good news that the perfect Son of God became a sin-bearing man who sacrificially died for sinners like you and me and was raised to new life to save them from their sins and give them eternal life to His glory. That’s the central message of the Bible. That’s the gospel and that’s what we were trying to share yesterday with our community. And any other path to salvation is a load of hooey. There is so much in that little propositional statement. All Scripture is “inspired.” That means more than just “inspiring.” It means that the Scriptures are sourced in God. They come from God. The Scriptures are God’s Word. You can build your life on the Bible because it supernaturally comes from a God Who knows everything and has revealed Himself and His plan beautifully through His prophets and apostles and other Scripture writers and can be trusted completely. Now, that doesn’t mean that God didn’t use men to write the Bible. He did. At least 40 authors over a 1400 year period. The Bible was written by Godly humans utilizing their personalities, situations, and thoughts. But God did it in and through them. God superintended the whole process so that what was produced is in fact God’s Word and not just the Word of Man. The Greek word there for “carried along” is the same word as the wind filling the sail of a boat. The Holy Spirit filled the sails of the scripture-writers to take them to the destination that He desired. That’s what you hold in your hands. A God-breathed book. Now, that is not what the world says. The world says that the Bible is merely a human product of fallen men which actually hides the truth. It’s just another religious book. It’s just like the Koran or the Bhagavad Gita or the Book of Mormon. That’s what the world says. Of course, it’s a lie. But many people want to believe a lie. Even people in the church. But as for you (v.14) continue in what you have learned and become convinced up because all Scripture is God-breathed. #3. AS USEFUL FOR ALL OF LIFE. V.16 again. I love this passage of Scripture because it tells us how very practical the Word of God really is. It is useful for teaching, rebuking, correcting and training in righteousness. It is rightness. It is uprightness. It is what is good and pleasing to God. We cannot be righteous on our own. We need Christ’s righteousness reckoned to our account. But after we come to Christ and get His righteousness as a gift, He begins to work out His righteousness in our lives. What is true of us positionally becomes increasingly true of us practically. And the Bible is one of the God-appointed means of growing in practical righteousness. In other words, the Bible tells us how to live. The Bible tells us how live lives that work. Lives that are wise and righteous. It’s street-level practical. It tells us the most important things that we need to know. You know we’re supposed to do good works, right? Not to earn our salvation but flowing out of it. How do we get ready to do those works? Bible. What you hold in your hand. This is what we call the doctrine of the sufficiency of Scripture. It doesn’t say everything that is true about everything. 2+2=4 isn’t in the Bible. But it tells us the most important things we need to know about everything that we need to know. The Bible is sufficient and useful for all of life. Notice the 4 ways here that Paul says it is useful. V.16 again. Teaching is laying out the path. How a Christian should talk, relate to others, do their work, and so forth. The Bible rebukes us when we need it, praise God! Correcting is showing us how to get back onto the path. And Training is showing us how to stay on the path. How to stay righteous and stay moving in righteous directions. The Bible is sufficient. It is useful for all of life. So many people don’t seem to believe this! If you have a problem, do you run to the Bible for answers? Or do you run somewhere else? Christians build their lives on so many other things than the Word of God! We need to repent of that and begin to build our lives on the sufficient Word. So, here are three points of application. This book is not magic. It is supernatural, but it is not magic. And it does not work by osmosis. Just because you hold it in your hands or place it on your head does not mean that it is at work in your life. You’ve got to get into the Word and have the Word get into you. And I don’t mean just a little verse or two a day. We need to read and re-read and study the Word of God. Notice that Paul calls Timothy to continue in it. And he says that Timothy knows it. He knows that Timothy knows it. He’s known it since he was an infant! Do you know it? Do I? So often I feel so weak in the Scriptures. Like I’m just starting out. We need to get the Bible into us. That means Old and New Testaments. Not just the easy parts. Are you involved in regular, systematic reading and studying of the Bible? If you aren’t, you aren’t growing. Guaranteed. This is one of the reasons why we are going start 1 Samuel next Sunday. And we have the same focus with our new Sunday School classes and Kids for Christ and ABC Kids and Youth Group that is starting up again next week. And it will be useful for our lives. Because what you have in your hand is God’s Holy, Inspired, Inerrant, Sufficient, Authoritative Word! What plan do you need to put in place this week to begin? Don’t just look in the mirror and then walk away. We need to trust the Word and obey the Word and bank on the Word and live out what we read in the Word. The other house was built on [what?] sand. Is there some area of your life right now where you are in disobedience to the Word of God? We’ve got to do what it says. And Third, Speed the Word. Share it. Spread it. Preach it. Give it away. In the very next sentence of this passage, Paul says, “I give you this charge: Preach the Word; be prepared in season and out of season; correct, rebuke and encourage–with great patience and careful instruction” (4:1-2). Don’t just read it. Pass it on. Share what you’ve learned with others. They need it just as much as you do. They need to know that God’s Word teaches the true path to salvation. How are you doing at sharing the Gospel with others? I read a scary statistic this week. A study has shown that 20% of non-Christians in North America (the United States and Canada) do not even personally know a follower of Christ. That’s 13.5 million people who don’t even know someone who is a Christian. The United States is a mission field. And we need to go into that field and offer to others what you hold in your hand. People need to know that God’s Word is the true path to salvation through faith in Christ Jesus. And they need to know that God’s Word is God-breathed. From God. Trustworthy, Accurate, True. And they need to know that God’s Word is useful for all of life. Sufficient. Helpful. Practical. Worthy of building your life on it. So, yes, let’s go back to school and master the books that our teachers tell us to master. But let us be MASTERED BY just one book the one you hold in your hand today. 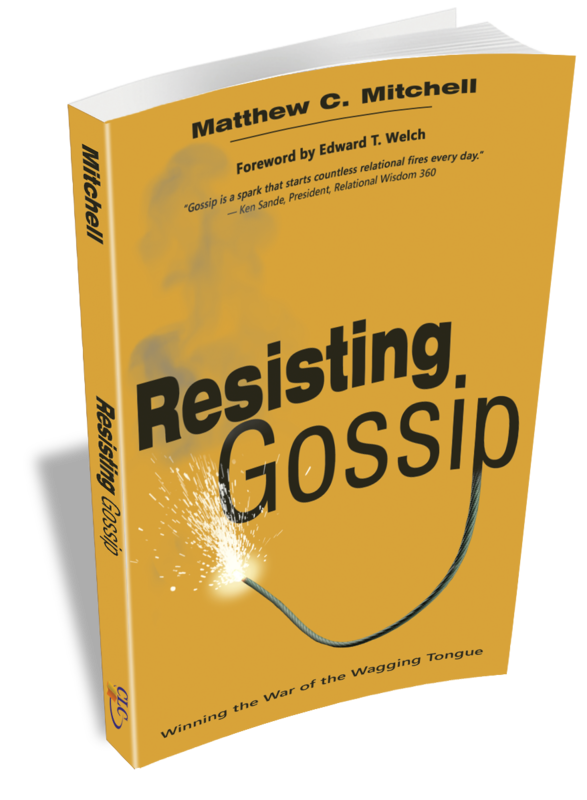 Readers can now preview, download, and read the table of contents, foreword by Ed Welch of CCEF, introduction, and first chapter of Resisting Gossip at the CLC Facebook page. Pastor David Kamara wants to encourage Christians who are the target of malicious gossip to be overcomers. In his self-published book, Overcoming Gossips, Kamara argues that gossip is prevalent, hurtful, and satanically motivated but is absolutely surmountable by followers of Jesus Christ. 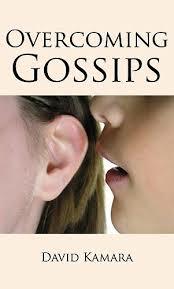 As a book, Overcoming Gossips has several strengths. 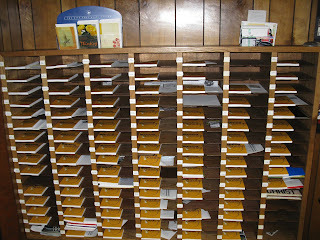 First, it is filled with scripture quotes and biblical references. Second, it includes short true stories of people who have been harmed by gossip and also helped by remembering their identity in Christ. Third, Kamara’s basic argument is sound. Those who understand who they are in Christ can gain confidence to survive the suffering of malicious gossip. Overcoming Gossips also has significant weaknesses. English does not appear to be Pastor Kamara’s first language, so his writing is very difficult to follow. And while abounding with scripture, multiple translations are put to use, especially the Amplified and Living Bibles, apparently chosen at each point based upon how much they prove the author’s point. The most concerning feature of Overcoming Gossips is how it veers, at times, into a triumphalistic tone. Pastor Kamara appears to be a Pentecostal Christian with an emphasis on personal success. Beloved, the glory of the Lord is already upon you and that is why you are being gossiped [sic]. People don’t spend time talking about a loser. They only talk about winner and you are one of them. . . . By destiny, you are a shining star and the only one that can stop you from shining is you (yourself) [sic]. Not some demons or gossips. . . . Praise God! You will shine in Jesus’ name! Kamara’s book could be substantially improved by balancing these confident statements with scriptures that teach that believers in this age will continue to suffer and are called to faithful perseverance while they wait for Jesus’ kingdom to come in its fullness. David Kamara, Overcoming Gossips (Bloomington: AuthorHouse, 2007). 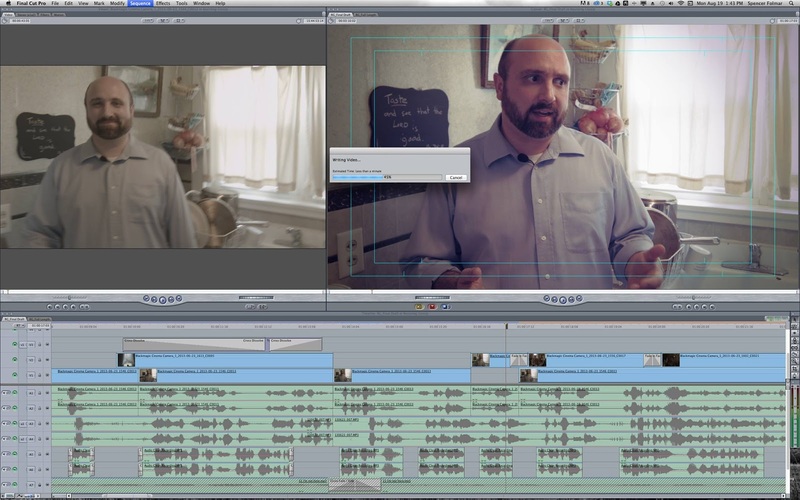 Presenting the "Resisting Gossip" [extended] Book Trailer from Third Brother Films on Vimeo. This new version of the trailer includes more information about the book itself. Please share it with your friends! 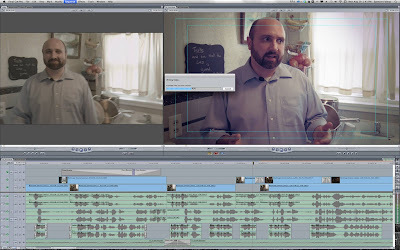 Here are some still shots from making the trailer with Third Brother Films. Note: All breezes in this short film were natural and God-sent, not artificial. It was a hot day, and I was really grateful. 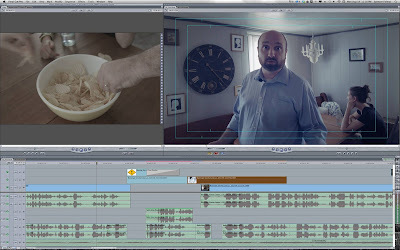 This is what Spencer sees on his computer as he edits it together. I look a little spooked in this one. Maybe I was afraid I wouldn't get any chips. Book Review -- "Grapevine: The Spirituality of Gossip"
Camery-Hoggatt believes that our lives are made up of little stories. There’s a lot of anxious talk these days about the decline of the meta-narratives in our culture. Without the grand stories, so the argument goes, we don’t know who we are. In this book I offer another view, one that is both more hopeful and more cautionary. Here I am concerned about the micro-narratives that are packaged in the daily conversations around the water cooler, in the coffee shop, on the porch, at the dinner table. These tiny stories–sometimes no longer than a few short sentences–can have a cumulative effect on our private experience that far outweighs the mass effect of the meta-narratives of the culture in general. This book is about daily gossip. There is a lot of wisdom in this concept. Our God is a God of details, a God who loves stories, a God who calls upon us to seize every little moment as a part of something grand. In twelve engaging chapters, Professor Camery-Hoggatt of Vanguard University, a former small town pastor, explores the concept of life as a collection of micro-narratives from a variety of interesting perspectives. Camery-Hoggatt illustrates everything he says with lively stories drawn from both fine and pop culture, from The Incredible Hulk to Dances with Wolves. He recognizes evil as evil and speaks about the darkness and “shadow” of human souls. Gossip can be very bad. I don’t think I can be as positive as Camery-Hoggatt about gossip, even noting that the term is very elastic. He sees benefits to even malicious gossip that I cannot. I am also sure that I do not agree with his psychological theory and its pastoral applications. I cannot commend Grapevine without several caveats and loud calls for discernment. But I do think that he has made many suggestions worthy of meaningful meditation, especially about how to season our Christian conversation with grace, and is correct that our view of our world, ourselves, and our God is created and sustained by millions of small social interactions–all the more reason to be very careful in how we talk and listen. 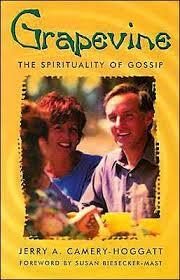 Jerry Camery-Hoggatt, Grapevine: The Spirituality of Gossip (Scottdale: Herald Press, 2004), 13. Though this is drawn from his Jungian psychological theory, so it may not always be consistent with biblical teaching on sin. Jerry Camery-Hoggatt, Grapevine: The Spirituality of Gossip (Scottdale: Herald Press, 2004), 168. Ibid., 196. If I understand him correctly, this idea dovetails with the concept of “holy gossip” promulgated by Kathleen Norris in an interview at Leadership Journal where she says, “I love the part in our Presbyterian service when, before prayer, we share joys and concerns. We hear about somebody's grandkids visiting from Spokane or the birth of a great-grandchild. We also hear about someone losing a job or going into surgery. That's when the gossips get busy after church and call around. They get in touch with friends, neighbors, and relatives—does he really want to see people? Or is he too tired? Should I drop in today? 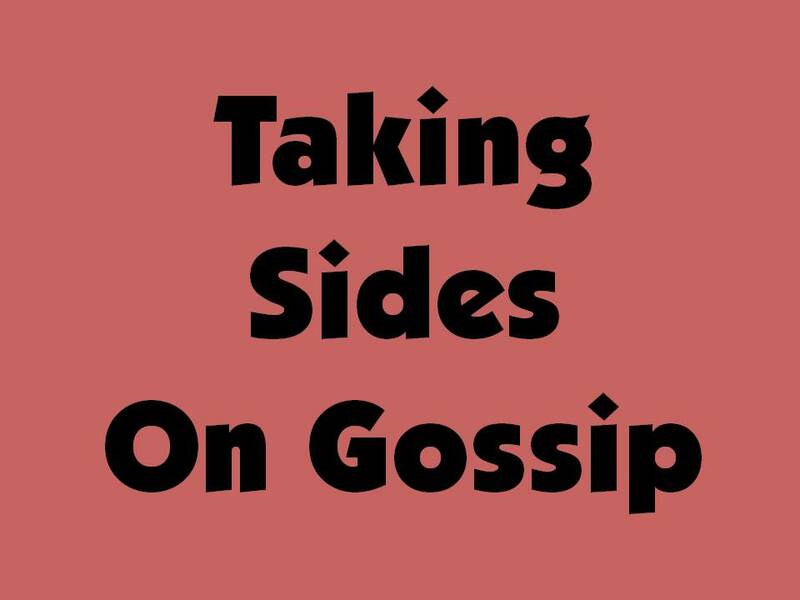 That is a good use of gossip.” Kathleen Norris, Mark Galli, and David Goetz, “Amazing Grace-Filled Gossip: An Interview with Author Kathleen Norris,” Leadership 20, no. 1 (Winter 1999): 56-61, in ATLAReligion Database with ATLASerials, http://ebscohost.com (accessed July 26, 2011). Jerry Camery-Hoggatt, Grapevine: The Spirituality of Gossip (Scottdale: Herald Press, 2004), 15-16. 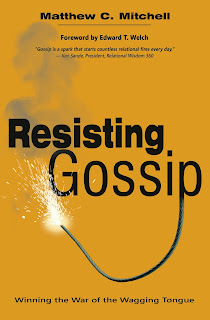 Rounding Up "Taking Sides on Gossip"
Countdown: 14 Days to "Resisting Gossip"